The most popular cooler sizes we have tested range from 40-50qt. Because these are so popular, we have tested the vast majority of cooler manufacturers in this size range. When a new cooler company releases a 45 qt cooler it's easy to asses the company's quality by comparing their performance [of the 45qt] with all of our data. Prior to this test we tested a Patriot 20Qt which performed really well. Needless to say we were excited to get the 45qt to really see Patriot's quality. After the 20qt set the precedence for small coolers, we were excited to see if the 45qt had similar capabilities to raise the bar for 40-50qt coolers. Cutting to the chase... the Patriot 45 set a new record. After nearly 10 days we were finally able to make this conclusion. The 45qt held ice for roughly 9.5 days. The previous record was held by the Techni Ice 47qt which held ice for 8 days. But Was It Really A Fair Test? 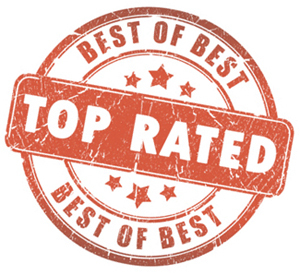 Testing procedure was exactly the same as every other test we have conducted. The 45qt was pre-chilled for 24 hours. After 24 hours, the cooler was drained and topped off with fresh ice. 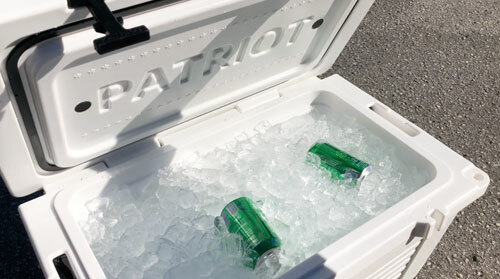 At the start of the test, the Patriot was filled to capacity with ice and two beverages. 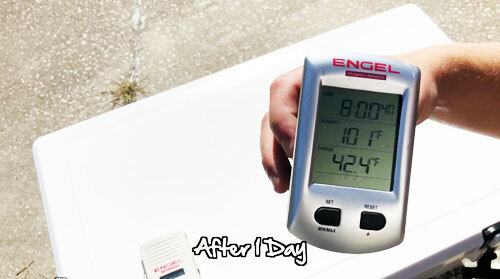 We then left the cooler outside, in the sun, for the duration of the test. The cooler was opened 3 times a day to monitor performance & simulate actual use. The lid temperatures regularly reached 80°+ with afternoon temperatures occasionally topping 100°. This was the biggest difference when comparing to our past test. Most of our tests have been conducted in June, with afternoon lid temperatures reaching 130°+. 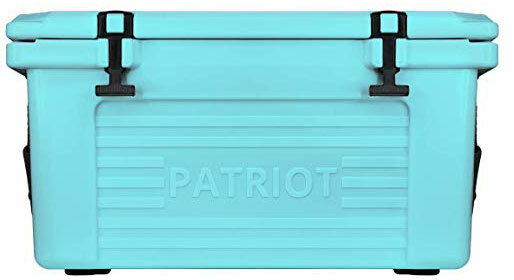 Having said that, we are in no way discounting the performance set forth by Patriot Coolers. This is merely a disclosure of testing conditions. Even considering cooler afternoon temperatures, the ability of the Patriot 45 to hold ice for 9.5 days is truly impressive. 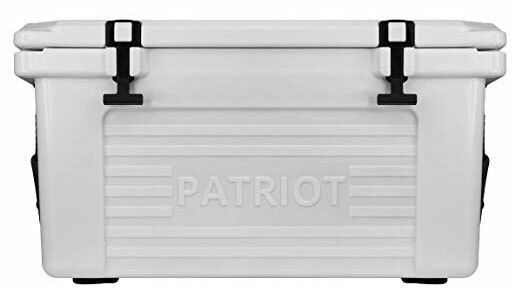 Because the Patriot 45 now holds the record for coolers ranging in size between 40 and 50 quarts, we feel obligated to test this cooler again in the heat of the summer. We will hold onto this cooler and match it up against our previous champion when temps heat up. In the meantime, the Patriot is the new king of the hill. Superior ice retention coupled with solid corporate values makes the Patriot 45 a no-brainer purchase. A portion of each sale goes to Homes For Our Troops and military discounts are always available on all of their coolers. Post to be updated Summer 2019.